The ram blood constitutes a bodily fluid composed from plasma (60-65%) and morphothic elements (30-45%). Ram blood is safe, being obtained from healthy animals, free from animal diseases: brucellosis, listeriosis, leptospirosis and Q-Fever. Ram blood is used as an additive to bacteriological media, rosette tests in immunology as well as Waaler-Rose reaction. 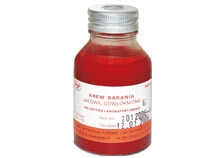 Frozen, it is used as an additive to bacteriological media for isolating anaerobes.